On Monday evening, a group of roughly 60 freshmen women with a sprinkling of some upperclassmen women gathered at Heritage Hall for an evening of reflection on what it means to be a Catholic woman. The evening was coordinated by the female student ministers who run Behold, an offshoot organization of Campus Ministry that hosts an event for freshmen women each month. The evening entailed refreshments, a lighted arch for photo options, and, one of the highlights of the evening, a chauffeur service from St. Vinny’s Chapel by the male student ministers for the ladies of Reagan and Ryan Halls. 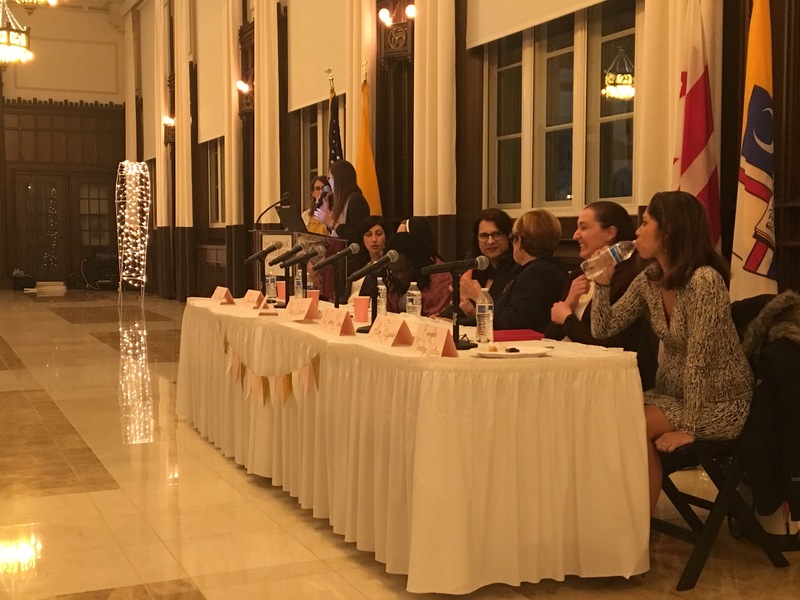 The main event consisted of a panel of Catholic and Christian women from all career paths across campus who were asked questions about being an authentically Catholic woman in the contemporary world. The questions were written by the student ministers and then opened to the students in attendance at the end of the evening. Seven women from all areas of the Catholic University community were invited to be on the panel. They included Elise Italiano, Executive Director of University Communications; Sister Maria Veritas, a Dominican sister of Mary, Mother of the Eucharist order who found her calling while a student at Harvard University ; Emma Toussaint, a Christian nurse practitioner at Student Health Services; Mary Warren, professor at the Busch School of Business, small business owner, and the mother of five children; Mrs. Jeanne Garvey, wife of the University’s president and mother of five children; Colleen Fitzpatrick, former student minister and alumni of Catholic University who is now a neuroscience graduate student at Georgetown University; Emmjolee Mendoza-Waters, Assistant Director of Campus Ministry, Catholic University alumni, and mother of soon-to-be five children. As Amanda Martin, a sophomore student minister and one of the coordinators of the event, commented at the end of the evening, these women speakers were specifically chosen to present diversity, to provide a broad perspective from women of different ethnicities, vocations, and career choices, and to show that being an authentically Catholic woman comes in all different forms. As the advertisements for the event detailed, there is no checklist for what it means to be a Catholic woman. In response to being asked about the stereotypes placed upon them as women and how one can overcome these, Fitzpatrick discussed the “Instagram Catholic” woman ideal and remarked how each Catholic woman chooses to evangelize in her own way. Garvey shared a story about how she resigned from the committee to organize her fiftieth college graduation anniversary when her remarks about pro-life feminism were dropped from the newsletter she wrote. When questioned about the contemporary feminism movement which seems to be anti-male, many of the panelists remarked they did not feel the feminist movement promoted this sentiment. Toussaint noted that men and women should “equal in mutual respect” while Emmjolee brought up the “complementarianism” of men and women. Perhaps the most interesting perspective of the panelists was provided by Emma Touissant. As she noted during the discussion, she is a Christian, not a Catholic. Yet, her insights perfectly aligned with the rest of the panelists as she shared the obstacles she ran into while trying to simply pray with her patients in the ER.